Enrique delivered a customized tour for a group of four meeting all of our expectations and many requests! Enrique was great - super knowledgable and a cool guy. He has a lovely temperament and we very much enjoyed our day with him. Best tour guide experience! The service was more than just a tour guide, but felt more like a friendly concierge service. Enrique customized the perfect tour based on my expectations and was flexible during the day. The tour was a good balance of sight-seeing, food tastings, drinking and truly experiencing Mexico City like a local. Taught me some Spanish too! His love for history, friendliness and professionalism all combined made for a stress-free trip. So much fun and would recommend him to everyone! Enrique was phenomenal and showed us an amazing time around Mexico City and Teotihuacán! He took us to his favorite eating spots, gave everything a personalized touch, and treated us amazingly! Make sure to book him whenever you're in Mexico City and need an expert with that personal touch! Thanks Enrique!!!! This tour was just what we were looking for! Enrique customized our full day tour according to our needs, pace and activities for the day. All we had to worry about is showing up and have a great time in Mexico City! Highly recommend Enrique , full of great facts, great food spots and a pleasure to be around. Great transportation , use of timing and comfort. This is my second time using toursbylocals , and will absolutely use again on my next adventure. Enrique was great! We enjoyed our trip to Teotihuacan. He customized our trip to get us some great food, pulque, tequila, and mezcal. TOUR GUIDE RESPONSE: Thank you Nathan! Too bad we probably walked by Glenn Close and missed her. Cheers! Enrique was an excellent guide. Knew where to eat with the locals. Friendly, fun and informative. We had a wonderful day with Enrique. Enrique was awesome! group of 6, comfortable car. The pyramids were spectacular great views and he took pics for us.He was very knowledgeable. We had two kids and he was flexible at climbing, Great views from The top! After he took us to not one but two places to eat to accommodate the group,great tacos!! We headed to anthropology museum, Chapultepec castle and the angel of independence, things we missed from previous day. He completed the city tour! He was so patient and cared for the whole group! Enrique did a wonderful job facilitating a tour that suited our diverse group: some climbed the pyramids, we all visited the fantastic mural museum, etc. and experienced the site. He was full of lively, up-to-date information about the archaeology, the city and the country: an articulate, fun representative of young Mexico. We spent two days with Enrique, and couldn't have asked to have a better guide. He was very flexible, knowledgeable, funny, and smart. We kept re-arranging our list of things to do, and he accommodated us each time. We had a blast learning about the Mexican culture and history -- he made our time together interesting and fun. Would give him more than 5 stars if it were possible!! Enrique covered our tour for a colleague who was unavailable, we don't think this was a tour he does on a regular basis, but he still did a great job. The tour of the Temple Mayor was a short walk from our hotel and the tour was well paced, we appreciated the information he shared during the tour. He had a driver waiting to transfer us to Xochimilco where we ate lunch in a small local restaurant before our boat trip. We enjoyed a very relaxing tour on the canals before returning to our hotel. We recently took a tour of the Teotihuacán pyramids with Enrique. He was extremely knowledgeable, engaging, energetic, professional, and overall fun to be with. He was extremely generous with his time, and very flexible with our tour agenda, for instance working in a visit to a specific restaurant we wanted to go to, as well as the Basilica of Our Lady of Guadalupe. We would highly recommend him to anyone considering a tour of the pyramids. Enrique was a wonderful guide to the temple and surrounding restaurant and workshop. He was also patient with our Ciudadela shopping. He was flexible with planning our day's itinerary. His English is perfect. His car was very comfortable for the four of us. He even took photos of us touring the temples on his own camera! Enrique picked us up on time. He explained a lot about the area leading to the pyramids and there as well. Enrique was open to adjusting the tour according to our wishes. We visited the Guadalupe complex and happened upon great activities there. We learned a lot of historical and cultural details and enjoyed the ease of communication with him. We had a stress free day in the company of a knowledgeable guide. Enrique was great, and designed a custom tour to fit all of our needs. He was really knowledgeable and easygoing, we couldn't have asked for more. Enrique is a true gem. He is friendly, knowledgeable, patient, and charismatic. He knew his way around every museum expertly, and gave me a real sense of what it would be like to live in Mexico City. He was the perfect guide to connect Mexico City's past to its present. I highly recommend Enrique as a tour guide! I did an art tour with him, but I would definitely sign up for his street food tour as well! He recommended the greatest places to eat all day . Enrique is a great guide and fun person to spend time with. We did the food tour and he provided a wealth of information about the food scene but also the city itself. He included some great hidden gems that we would never have found on our own. He has a great sense of humor too which made the day fun and relaxing. Kind, generous, flexible, social-justice-oriented friend. Xochimilco's canals, gondolas, music. Convenient Driver. Conversational, casual, & didn't overwhelm with facts, for big picture of Mexico's situation. Museo Delores Olmedo's Diego Rivera collection & marvelous grounds. Coyoacan market: got perfect gift. Covered food market for tostado & fruit drink. Neighborhood tacos. He accommodated our dietary sensitivities. Nothing touristy. Wouldn't have done any of it on own. Fun day! Enrique was a wonderful tour guide. He knows the city well, his English is excellent, and perhaps most importantly, he was able to read us well. We traveled with my mother-in-law, who is 75 and not able to stand in line for a long time. Enrique picked up on this and took us to sites around the city center where we would not have to stand in long lines. He also steered us away for tourist-y restaurants and took us to a local cantina for lunch. The food and the experience were wonderful. Enrique was a pleasure to spend time with! He was friendly, and very accommodating and flexible—changing parts of the tour based on what the group wanted to do. We visited Teotihuacan and Xochimilco, both of which he made very easy and fun! I would definitely recommend a tour with Enrique. Enrique was an amazing guide. Easy to be with, accommodating, knowledgeable and helpful in every way. We made our first trip to Mexico City very special! Enrique was prompt in responding to all our question before we selected him. He was thorough, detailed, flexible and easygoing. He arranged a very comfortable van to accommodate us. One highlight was going to a local restaurant and churro shop that he frequents, and the food was great. The icing on the cake was when he took us to a local jazz club where he obtained a "difficult to obtain" reservation for us. Fantastic evening with fantastic music. What a memorable trip! I highly recommend Enrique!! Enrique is an amazing tour guide!!! He is very intelligent, knowledgeable, warm-hearted and honest. He showed me parts of Mexico city, I wouldn't have found myself!!! He was flexible with starting and ending times, very willing to please and made me feel comfortable and happy . Thanks for a special time in Mexico City!!! Enrique was friendly, professional, articulate and knowledgeable. He provided many options to customize our day. His engaging personality made the day amazing! We give Enrique our highest recommendation! Great tour, gave us a very good overview. Friendly, flexible guide, who knows his city very well. But not only history, also shopping, dining and much more. Interesting discussions about the day-to-day live. Highly recommended. Thanks again. We engaged Enrique for a day tour of Mexico City with the goal of learning about the city and getting acclimated to the neighborhoods, history, and culture. Our primary goal was to have a local perspective/experience. Enrique delivered a fantastic tour that far exceeded expectations. He was very engaging from the very beginning and asked extensively about what our interests were and offered recommendations for the day. He remained extremely flexible with our tour, ensuring we saw what wanted. This tour was a great way to see several different parts of the city and tastes some amazing food! We would highly recommend this tour to anyone. Enrique was a ton of fun and I would book any of the tours he guides. We've had guides all over the world but Enrique was simply the best. When we wanted to speak Spanish so did he. When we got tired late in the day and wanted to speak English he did too and his English is flawless without an accent. His knowledge of Mexico City is unequal and he's fun, hip and cool. We learned so much and enjoyed our day more than you can imagine. He's a keeper!!! Enrique was punctual, informative and gave us a great customized four-day tour of Mexico City. We appreciated his attentiveness and assistance with our dietary needs and itinerary flexibility. It was a really great trip. We and our 10-year-old enjoyed it very much. Enrique is an excellent tour guide & we learned a lot about the pyramids and ancient cultures from him - and had a delightful time doing so! Enrique is eloquent in the English language, his accent is minimal and he communicates quite well (I am deaf in one ear and appreciate this). Tops in personality, too. He is also very courteous and generous. In case you wonder, his car is a lovely modern sedan with plush seats, very clean, and very comfortable. My daughter and I recommend him highly. 5 days with Enrique. Asked for an unusual tour (out of the city, meeting local people, art, food and info.) Enrique is laid back, motivated to meet your needs. he actually connects. Enabling one to ask many questions re: culture, religion, politics, traditions etc. We visited homes of his friends at different socioeconomic levels. Willing to go as slowly or as quickly as needed. Old or young not an issue. Great english. 2 months of e-mails to meet our special interests. TOUR GUIDE RESPONSE: Hi Audrey! Thank you for sharing your thoughts about our 5 days together! I had a great time too!! Hope I contributed to making your experience in Mexico good enough for you to want to come back very soon!! All the best and please say hi to David for me!! Cheers!! We had a great day with Enrique, he was knowledgable and incredibly fun to be with. We'd highly recommend him to anyone! Erique was a great guide. He speaks excellent English. He had good knowledge of the Mexican history and knew the city very well. He showed us Mexico City downtown, Tula and Teotihuacan. He showed up on time and stayed with us all day and kept us safe. He took pictures with his camera and sent them to us. He was very considerate to all our needs and kept the pace accordingly. He had comfortable van throughout our visit. Our experience was very pleasant and I highly recommend him to my friends and family. Since I did not go on the tour due to illness, my review is sparse. My friends liked the tour and they learned a lot. They like Enrique. However, the tour of the pyramids was a bit too long—the original request was to see the pyramids and well as another area of the city. A visit to 3 sites rather than 5 would have been enough. Enrique arrived on time with his excellent driver. We all enjoyed breakfast and lunch together. Most importantly, in between he gave us a terrific tour of Teotihuacan. He laid out all the options of the day and we chose what to do. Enrique is fun, knows his stuff, and is an all around good guy. Plus his English is excellent. Highly rated. TOUR GUIDE RESPONSE: Thank you el muchacho for tour like aires Nancy! Glad to be part of the good experience you've had in Mexico. All the best!! Enrique was our guide and he was wonderful....personable, very knowledgeable and an absolute pleasure to spend the day with. He personally accompanied me up the highest pyramid to be sure I got up and down safely. His attention to my wife's needs were most appreciated. His guided tour was one of the highlights of our stay in Mexico City. We took the five hour tour and it was perfect. Highly recommend Enrique. Enrique was an incredibly knowledgeable guide who's command of both English and Spanish was inspiring. He was entertaining and engaging for our entire family and left us with a true sense of fascination and wonder at the incredible level of effort that went into the construction of this city and the mystery that surrounds it. We want to go again! Wow! 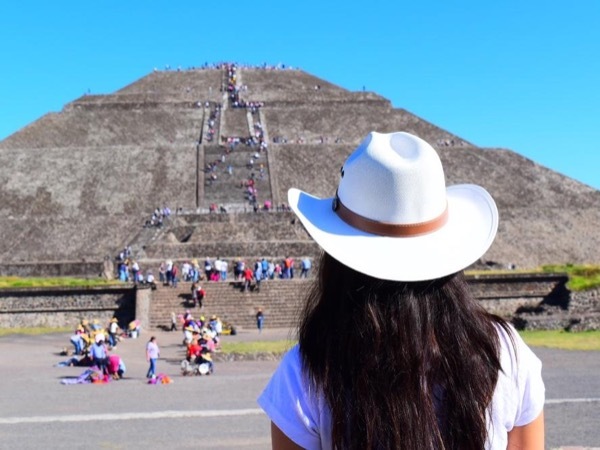 I couldn't be more happy with this thrilling experience- we got to witness the pyramids at Teotihuacan and the whole experience felt like magic. I've never seen anything like this historical masterpiece, so I'm really happy Enrique offers this experience. We also ate at the best authentic Mexican all you can eat cantina and I loved seeing live traditional dance and music performances, not to mention authentic obsidian carvings by local sculpture artists. Please don't wait a moment to take this tour! Wow, I would highly recommend Enrique as your next guide to Mexico City. I was thoroughly impressed by Enrique's depth of knowledge regarding both food and history, creating the perfect blend of new experiences as we traversed the historic center of Mexico City. I loved his outgoing personality and how prepared he was for our every need, including water, sunscreen, and even strategically planned bathroom and sitting breaks to rest our feet. Thank you for an amazing and memorable experience Enrique! Enrique was, by far, one of the best tour guides we have ever had! His flexibility, kindness, and professionalism is unmatched by most all guides we have had before. He even bought us magnets at Teotihuacan! Be sure to schedule with him when in Mexico City! Enrique was, by far, one of the most generous, kind, flexible, and knowledgeable tour guys we have ever had! My family has traveled all over the world, from South America to Europe and Africa, and Enrique's professionalism and amazing demeanor is absolutely unmatched. When in Mexico City, make sure to schedule with him! Exellent Tour by Enrique, he was very friendly and accomodating, highly recommend his services when you visit Mexico. Enrique was a great tour guide. I wanted something very simple and easy - I didn't need hours and hours at sites and he understood this. The visit to the pyramids a highlight! Enrique is a local Mexican guy, young and a great option for anyone looking for a tour anywhere! Such a nice guy. Thoughtful. On time. Relaxed. Accommodating. Knowledgeable. Thank you! Enrique was prompt, knowledgeable, and fun to hang out with. We had a group of 10 for a bachelor party and he gave us the perfect tour of the pyramids we were looking for. It was a comfortable, air conditioned ride from where we were staying as well. I recommend Enrique for future private tours and I would book him again if I was back in town. Enrique was a fantastic and friendly guide! It was the best way to visit the ruins -- he picked us up right outside of our apartment, we had a fantastic breakfast before climbing the ruins -- which were incredible. He was very knowledgeable and really adapted to our mood and energy level. He even brought extra water and some Mexican candy for us :) I highly recommend this tour with Enrique -- great guy and incredible experience!! "We were all 7 of us extremely delighted with the Sunday tour. Our tour guide, Enrique was terrific. He was knowledgeable, accommodating and very pleasant. I will definitely recommend your city tour to our friends who are traveling to your beautiful city." His attentive communication for our very last minute tour worked out perfectly. Enrique was knowledgeable, patient and fun to be with for our long day tour of Mexico City. His car was comfortable w/ A/C and his driving skills were safe. He stopped & lingered for anything we wanted, including a quick stop at the dept store! Took us to lunch like locals. We even felt like VIPs when we forgot to buy our own museum tickets and he got a friend to help out! I highly recommend. TOUR GUIDE RESPONSE: Hi Melvin! It is great to hear from you, and even better to know you enjoyed our day together as much as I did. Thank you for everything too and do let me know if you ever come back for some more Mexican adventures! I´ll be happy to do the second part!! All the best!! Enrique was a wonderful guide and our trip to Tepotzlan was a highlight of our trip! We started out by visiting a local chocolate shop to get some caffeine before hiking up the mountain. Great way to start the morning! He was knowledgeable yet laid-back in his style, and after the hike, took us to a wonderful place for lunch and ice cream, and finished off at the market. Well paced for our family of various physical abilities. And he was so generous to get us a handicraft gift and a taste of Pulque. Enrique organized our boat tour of the lake of the Floating Islands, and the boat ride was fantastic. We had a private boat for our group, with great food and drinks, and ultimately a mariachi band. My wife and her parents were extremely pleased by the afternoon's boat ride: it was exactly the experience that they had hoped for. This tour to the pyramids was fabulous. Enrique knows many details of pyramid construction and history, and he is a great guide. He is also very flexible, and adapts his tour to the abilities of his customers. He set up the balloon ride for our group, and was very helpful in many ways! Enrique is articulate, informative, and charming. He is a great guide to Mexico City. Enrique was wonderful. He picked our family of 6 up (with his driver) was very friendly with us all. Even He was a local resident of Mexico City, born and bred - but spoke fluent English. His tour of the pyramids was perfect -- filled with all the information we could ever want, but made it fun for the kids. He had some friends along the tour which was nice to get a little extra attention. I would definitely recommend a guide if you are doing the pyramids -- well worth it. And Enrique is your guy! The tours by locals service is excellent. My guide, Enrique was one of the, if not the best tour guide I have ever been guided by. He clearly understands the notion of customer first. He was extremely diligent and tirelessly arranged all of my requests (some not typical tourist endeavors) in advance and able to suggest valuable points of interest to fill open time in parts of the agenda I had not planned. If you are lucky enough to secure the services of Enrique, you will not be disappointed! Enrique is a one of the greatest guides I have met. He is very talented, skilled and you will definitely not have a boring time with him. He plans his tours very well and you can feel very safe in the Mexico City surroundings. Enrique is the best guide and extremely fluent in English! He knows the places in Mexico City that are hidden from an average traveler. Be it certified street food or safe insured parking spaces, he had us covered. You wouldn't go wrong in hiring Enrique if he has availability. We booked back-to-back tours w/ Enrique. The first day was a Mexico City tour and the second day was a Teutocahn half-day tour. Enrique is a relaxed person - speaks perfect English - and knows Mexico City well. He got on great with our elder 2 boys (13 & 12 year olds) discussing music, games and just talking. Everything was at a relaxed pace - he was easy to work with & very flexible. Because parking was very hard, he even called in his friend to come drive us so we didn't have to deal with it! We scheduled three different guides during our Mexico City trip. Enrique by far was the most accommodating of the three. He was very patient and did not have any problems with us changing the schedule. We told him what our interests were and what we wanted to visit. Enrique even took us to some of his favorite spots for food, coffee and hot chocolate. If we were to return to Mexico City we would definitely request a tour with him again. Thank you Enrique for a wonderful day! My 2nd Express Tour started with Frida Kahlo's Casa Azul and museum in Coyoacan. After the self-guided tour, Enrique and I walked through the plaza taking in the sights of this lovely town. Great tostadas at the local market and yummy churros for dessert. Enrique knows just where to go for the best food and drink! Flatboat ride along the canals of the floating gardens of Xochimilco; delightful! Once again, Enrique showed that he knows how to design a tour! Informative and full of local sights and sounds! My, my what a day!! I was a little hesitant about the hot air balloon ride, but SO glad I did it. Enrique took me to the site and up I went! Perfect way to see the Teotihuacan complex! After the ride we had a delicious buffet breakfast with local fare, spent several hours walking through the site with Enrique explaining the significance of the pyramids and surrounding areas. Visited a shop with beautiful obsidian and silver works. Ended the day with a tour of the Museum of Anthropology. Unforgettable day! Enrique was the ideal guide for my 4 days in Mexico City! Every tour we went on was customized based on my interests. He is passionate about what he does and so very flexible with itineraries and the time it takes to see everything. It's such a treat to have a guide that isn't rushing you through the sights. This first express tour concentrated on the historic center, the Templo Mayor site and the downtown area of the city. 10 hours later the day ended with Mariachi players and a big smile from me! Great tour! Having very little time in the city, I feel like I nevertheless got a sense of the place and its incredible history. Enrique speaks 100% fluent English, provided lots of interesting commentary, and the car was very new, clean and comfortable. I look forward to seeing Enrique again the next time I find myself in Mexico, or the next time he comes to Canada! Erique is a great local guide. He is very friendly and goes out of his way to make the group feel comfortable. He is also very flexible and willing to work with the group to plan a customized itinerary. With our tour in Teotihuacan, Erique took us to all the major sites and was able to provide good context/stories behind them. Enrique is a kind and conscientious guide. He is thoughtful and willing to shape an experience as requested. What he lacks in occasional specificity - but who could know everything about a multi-million person city which is centuries old - he more than makes up for in genuine interest/curiosity/earnestness for all subjects . I recommend him whole heartedly and blame the tourist for any deficiencies in experience. Using ToursByLocals was an amazing way to experience Teotihuacan near Mexico City. Enrique our guide was very personable and we had the greatest time spending the day with him. We gained insight into the heritage of Mexico City that toursts don't normally get to discover. Enrique was thoughtful, good-humored and attentive to all our questions and added to our experience. If you want to have an excellent tour Enrique is highly recommend. Good knowledge of the area, more than willing to change schedule, excellent knowledge of languages. TOUR GUIDE RESPONSE: It was a great time with you and Megan, Stuart. Hope you come back to visit soon!! My wife and I were very satisfied with our tour of Mexico City with our tour guide, Enrique. Enrique took us to a lot of places where we were able to learn the history of the city, as well as to alot of great food locations so we could enjoy some excellent, authentic Mexican food. Thank you for this opportunity!